Price Range: $124.97 to $129.97. It is a medium to full body cigar that features an Ecuadoran Habano wrapper, Nicaraguan Criollo binder and a Nicaraguan filler blend of ligero, viso, and secco. It boasts a powerful culmination of rare spice and leather flavors with a rich, sweet earthiness you will love. Written on October 16, 2012 by Andrew Nagy of Cigar Aficionado. Hammer + Sickle’s Hermitage No. 1 St. Petersburg, the brand’s first cigar that incorporates tobaccos from Nicaragua, is now on its way to retail shops throughout the United States. 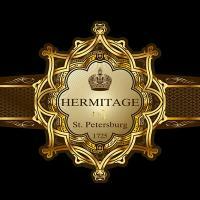 Introduced at this summer’s IPCPR trade show, Hermitage No. 1 sports an all-ligero binder composed of tobacco grown in Estelí, and the filler is a mix of Criollo leaf from the Jalapa Valley. The all-Nicaraguan insides are covered by an Ecuadoran Habano wrapper. Brand owner Eric Hanson says the reason he chose to delve into the world of Nicaraguan tobacco for the first time was simple: He wanted to add a medium- to full-bodied cigar to his brand portfolio. “Immediately, we knew it needed to be Nicaraguan, as this strength profile is the country’s sweet spot if you will,” said Hanson. Hermitage, which is being rolled at Tabacalera Aguilar in Honduras (another first for Hammer+Sickle), will debut in three sizes: 5 by 52 Robusto, 6 by 54 Toro and a 7 by 56 Double Corona. The line runs between $8.40 and $8.80.